Making cities easier places to travel around by bike has many benefits: reduced traffic congestion, air pollution and greenhouse gases, as well as improved health and welfare. Whilst this is increasingly recognised within government, widespread social and environmental change to increase the number of cyclists has not been so readily forthcoming. Currently, cycling in the UK is a marginal activity with only 2% of trips being made by bike. Levels of cycling vary, quite often dramatically according to gender, income, class, ethnicity and age. This study explored how these social-economic factors influence people’s tendency to cycle in the city of Manchester, UK. 115 surveys and 42 in-depth interviews were completed by residents in two different parts of the city, the wards of Miles Platting & Newton Heath and Chorlton. 1.6% of residents travel to work by bike in Miles Platting, 13.5% have managerial roles and the average house prices is £78,230. In Chorlton, 7.1% travel to work by bike and 50.5% are employed in managerial roles and the average house price is £241,513 (data from ONS Census 2011 and HM Land Registry 2011). Whilst it is important not to overlook the high levels of variation within these two wards, what these figures indicate is distinct differences in levels of cycling and social-economic contrasts between the two areas, making them useful locations for this study. 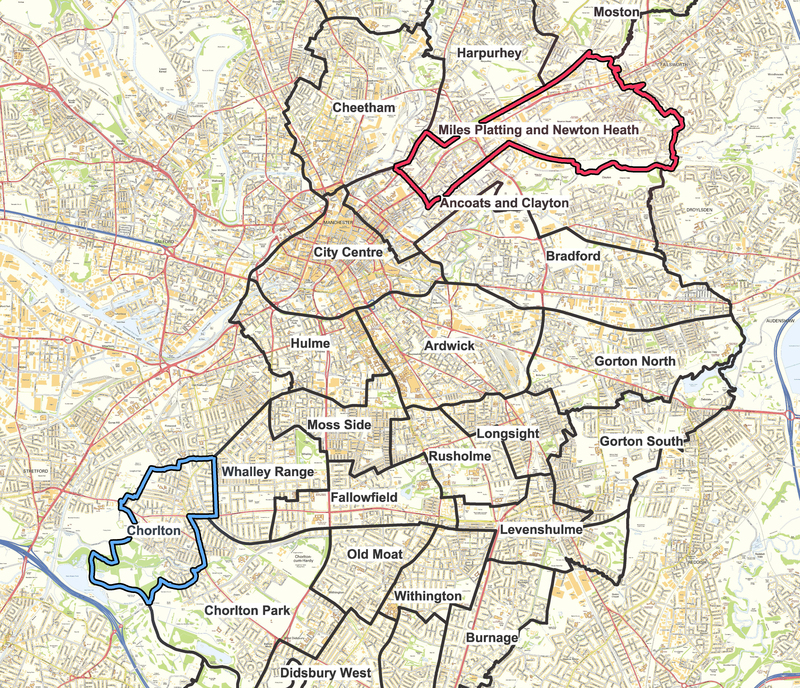 Manchester Ward Map showing the relative locations of Miles Platting & Newton Heath and Chorlton (Manchester City Council, 2013). This research found the key barriers preventing people from cycling – road safety, the weather and impracticalities – to be common across all social-economic backgrounds. The key motivations to cycle however – the cost of travel, getting exercise and reducing one’s environmental impact – were found to be different and were heavily determined by the social networks, the friends, colleagues and family members one has around them. These findings suggest that whilst improvements to cycling infrastructure are important for encouraging more people to cycle, so too are an individual’s social surroundings and economic situation. This study therefore supports the implementation of ‘soft’ measures to encourage cycling – such as cycle training and social cycling events, in addition to greater support for those of limited economic means to gain access to a bike – alongside ‘hard’ infrastructure improvements, such as improved cycle lanes. 1) Cycling, unlike other modes of transport is highly gendered. In line with many studies, men expressed a greater tendency to cycle than women. Compared with other modes of transport, cycling displayed the biggest gender imbalance of all modes of transport (see figure 1, below). Figure 1. 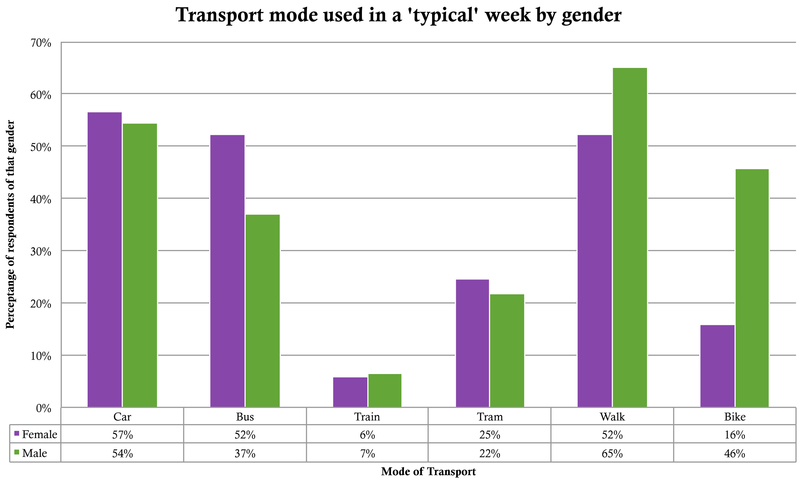 Modes of transport used in a ‘typical’ week according to the gender of survey respondents. 2) There was a generally held view of cycling as being a dangerous activity. This was acknowledged by the majority of interviewees regardless of how often they cycled. Those that regularly cycled (at least once a week) overcame the their fears through practice – building confidence and coming to think of cycling as manageably safe by taking precautions such as cycling down quieter streets and/or wearing cycle-safe clothing (helmets and hi-viz). 3) The most popular modes of transport used according to household income showed a similar trend in both areas with greater use of public transport by those with lower household incomes, and greater use of the car by those with higher household incomes. Cycling appeared to be more popular among those with higher incomes and least popular among middle income households (see figure 2, below). Figure 2. 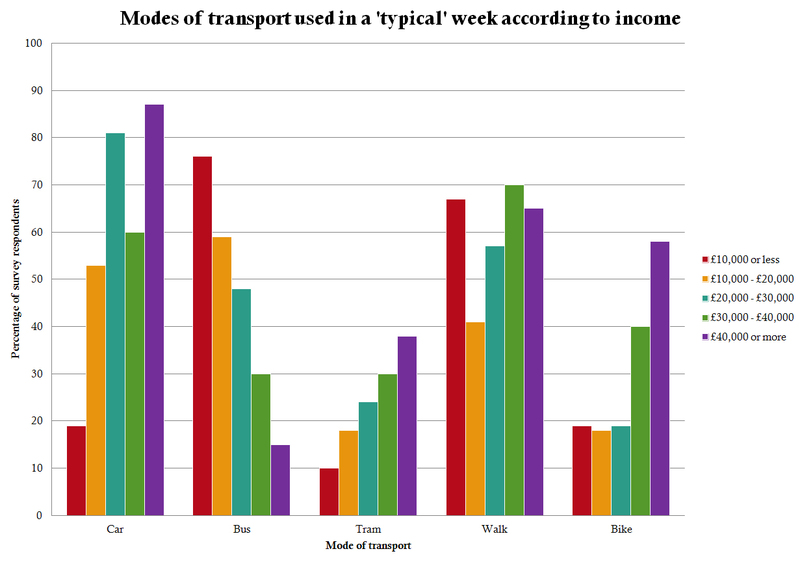 Different modes of transport used in ‘typical’ week according to household income of respondents. 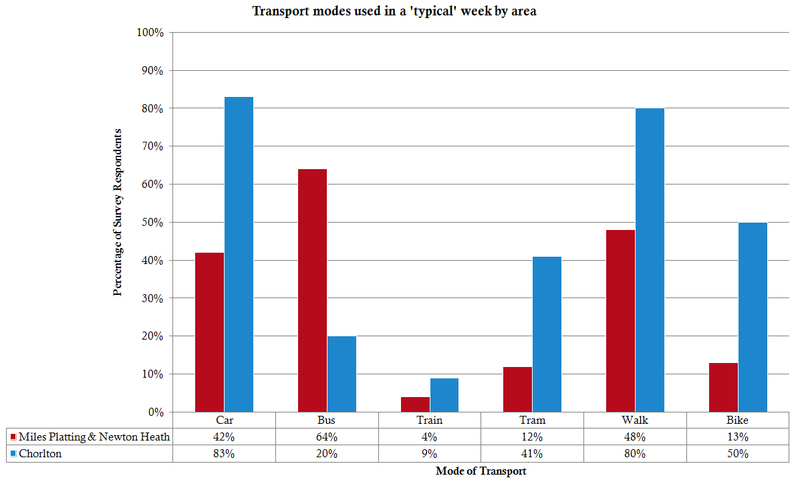 4) Of those surveyed, more cycled in Chorlton, where the car was the most popular mode of transport, than in Miles Platting & Newton Heath, where buses were the main mode of transport amongst those surveyed (see figure 3, below, please note small sample size mean the statistics cannot be taken as being representative of the area as a whole). More of the interviewees from Chorlton referred to cycling for leisure purposes, whereas in Miles Platting & Newton Heath where cycling was mentioned it was often referred to in the context of getting from A to B. 5) Many those who cycled were also car drivers. The majority of those who drove and rode a bike expressed increased awareness of other cyclists or drivers when they were travelling. 6) Cycling was heavily influenced by the social relationships people had with those around them. Having people around them who cycled, whether their own children or colleagues at work affected how people spoke of and thought about cyclists, whether or not they regularly cycled themselves. Whist clearly people do not just cycle because their friends or family do, what this and other research has found is that it is a key constituent influencing someone’s attitude and behaviours towards to riding a bike. 7) Cycling was viewed widely as being an activity one does quite normally as a child, but not as an adult. The majority of those surveyed, 76% had experience of riding a bike but less than a third, 27% were currently cycling. This was despite cycling being referred to by many in very favourable terms in the context of childhood. Some talked of not feeling a need to ride a bike or referred to cycling an inappropriate activity for an adult. Many also talked of how they felt the roads were much busier and less safe compared with when and where they grew up. Clearly whether or not someone rides a bike is related to whole range of factors. The nature of the built environment matters as do social-economic factors, such as being able to afford a bike and the social environment of which someone is a part. Measures to encourage more people to cycle therefore need to address both these areas. At a time when people in the UK are travelling more than previous generations, emissions from transport are continuing to rise, and health conditions associated with high levels of inactivity are becoming increasingly prevalent and costly, choosing to cycle has arguably never before been so vital. Research undertaken as part of an undergraduate dissertation completed in May 2014 by Geography Student, Tim McKenzie, University of Manchester, School of Environment, Education & Development. To comment on this research please visit Tim’s personal website.